When you visit Wildwood you'll find hundreds of different places to get ice cream. Some of these places are right on the Wildwood boardwalk and some are sprinkled throughout the island itself. Many of them offer the classic flavors and others will offer 100's of different combination flavors along with various toppings. Visiting the Jersey Shore just isn't complete unless you try out some icy-cold treats and today, we are listing five of them for you to consider. 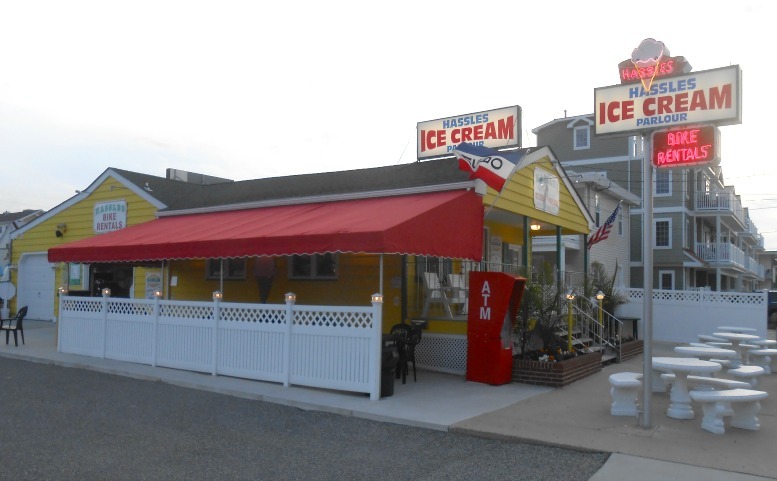 Here are our Top 5 Great Places to Get Ice Cream in Wildwood New Jersey. 1. 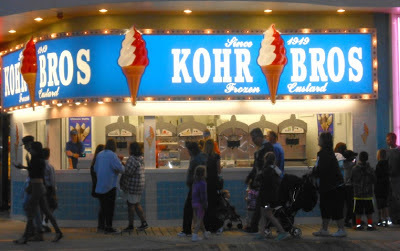 One of the most famous and BEST places to get ice cream is from Kohr Bros who has been in business since 1919. They have some of the creamiest and smoothest ice cream and frozen custard on the entire east coast! You'll find them at several different locations in Wildwood & Cape May. If you ask my husband, this is his favorite place to get a classic chocolate cone! 2. 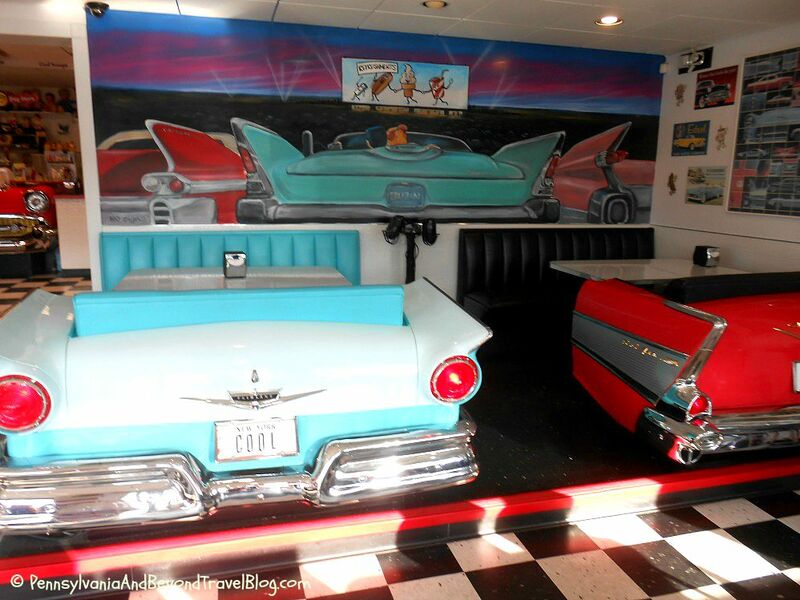 If you're looking for a fun family experience we recommend that you check out Cool Scoops which is a Doo Wop style ice cream parlor. They have a lot of different flavors of ice cream and offer sundaes and milkshakes too! My grand daughter loves this place because of all of the different toppings that they have to offer. What makes Cool Scoops super fun is the adorable vintage-style car seats that you can sit in while enjoying your icy-cold confection. Aren't they adorable? 3. Hassles Ice Cream Parlor is definitely on our top 5 places to get ice cream when visiting North Wildwood. This parlour has a lot of your classic flavors & popular flavor combinations that are rich, creamy and delicious. You get really nice portions with Hassles and their prices are decent too. After you've enjoyed your ice cream, you can take in a round of miniature golf which sits right behind their parlour! Looking for bike rentals? They've got those too. 4. Rounding out our list is Ken & Mary's Ice Cream and More which is located on the boardwalk. While they don't look like much, their ice cream is good and super affordable. In addition to the icy-cold treats, they offer your classic-style soft pretzels and cold beverages too. They're not fancy here at all but it's a great place to the kids. 5. The Seashell Ice Cream Parlor is located in North Wildwood, about 1 1/2 blocks back from the boardwalk. They offer your classic flavors, mixed flavors and you can get milkshakes here too! My little grand daughter likes coming here due to their bright decor colors & she likes that we will sit outside at one of the tables or on a bench to enjoy our ice cream. Their's is pretty good when it comes to taste and we find that their prices are affordable too. 6. Lizzy's Ice Cream Shop is located on Jersey Avenue in Wildwood, a few blocks back from the boardwalk. We decided to add this one to our list after visiting Lizzy's twice in the past few months. They offer a wide variety of different ice cream flavors, sundaes, sundae toppings and milkshakes. The reason we've added them is because they're really affordable as compared to other shops in the area. As an added bonus, they're ice cream is really good too!!! Well, there you have it. 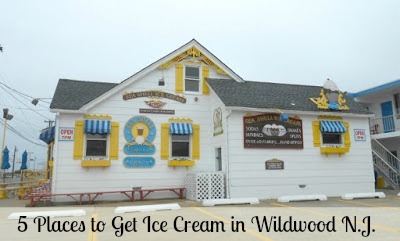 Our list of 5 Great Places to Get Ice Cream in Wildwood New Jersey. Some of these places are located directly on the boardwalk and others are a few streets back. I love ice cream, so when we are able to visit Wildwood I want to try most of these parlors. I like Hassles because I can rent a bike to pedal off the calories I have consumed! !